A hub of posh boutiques, enterprising micro-breweries and sprawling tech parks, Bangalore is also a city with many personalities, shaped over time due to its multi-layered history. Folks who seek to experience the classic royal charm of Bangalore can head over to one of its older landmarks, the sprawling Tudor-inspired estate of Bangalore Palace. The palace was built in the year 1887 by King Chamaraja Wadiyar and is today open to the public who come to witness the lavish and elegant splendour of one of South India’s most enduring dynasties. The area where the palace is now located originally belonged to Reverend J Garrett, who was a school principal in the cantonment town. It was purchased in 1873 by the guardians of Chamaraja Wadiyar and construction began in 1874. John Cameron, the person behind Lalbagh was enrolled for the landscaping of the palace and surrounding areas. Initial construction was completed in 1878 and subsequent additions and renovations have been carried out since. The palace features mainly wooden interiors and is surrounded by gardens. The architectural style is a mix of Tudor and Scottish Gothic with many physical elements inside imported from Britain. It is believed that Chamaraja Wadiyar found inspiration in Windsor Castle and other structures of Normandy and England. Some of the defining features of the two-level granite structure include the fortified towers and the turreted parapets, quintessential elements of Tudor buildings. Roman arches greet visitors at the entrance. The facade of the building boasts many different shapes and projections. The vine -covered walls make the palace look like it was lifted out of the English countryside. The living quarters of the palace reflect a more traditional Hindu style of decor, connected to the rest of the building with a walkway. Pillars and arches dominate the interiors of the Bangalore Palace. Ornate cornices and patterned walls add to the lavish setting of the building’s rooms, along with luxurious chandeliers. The courtyard of the Maharaja features a fountain gifted by an erstwhile Spanish royal and a coloured tile bench boasting an art-deco design. The palace is also full of many elephant trophies, hunting was a favourite pastime of the old Wadiyars. The Palace is home to many renowned 19th and 20th century paintings, including those by Raja Ravi Varma, one of India’s most famous painters. There is a large collection of photographs that chronicle the different generations of the Wadiyar dynasty along with offering a glimpse into the evolution of Bangalore over the last century. Apart from the beautiful works of art, the intricate architecture and photography collection, there are more attractions in the palace. A weighing chair for jockeys is one of the unique curiosities in the property. A Coat of Arms, which was gifted to the Wadiyars by the British, is also another attraction at the Palace. Close to the palace, one can find the Fun World Amusement Park which features many rides including a snow room and water slides. The grounds today are a continuous hub of activity as they provide the venue for large wedding ceremonies and various trade and retail exhibitions. The gardens around the palace are well-maintained and there is a restaurant in the premises where one can relax and enjoy delightful meals along with alcoholic beverages. Another famed attraction in the vicinity is the Equestrian Centre for Excellence. This horse riding school is known to have produced many famous jockeys and is home to a thriving population of high-breed horses. 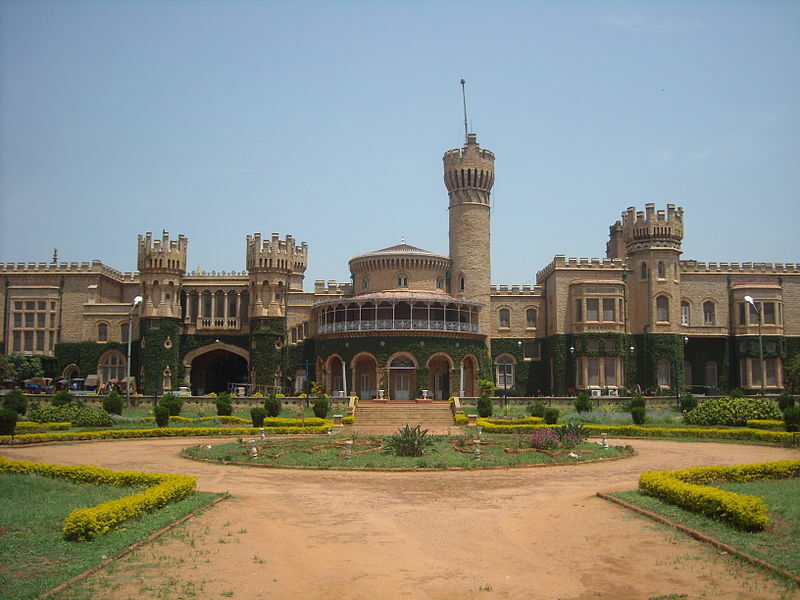 Bangalore Palace enjoys a central location in the city and hence there are multiple private and public transit options. The drive to the palace from the nearest airport, the Bangalore International Airport, should take an hour, via Bellary Road covering around 30 kilometres. The closest railway station to the palace is the Bangalore City Railway station. It is just 4 kilometres away and the journey would take around 20 minutes with regular traffic. 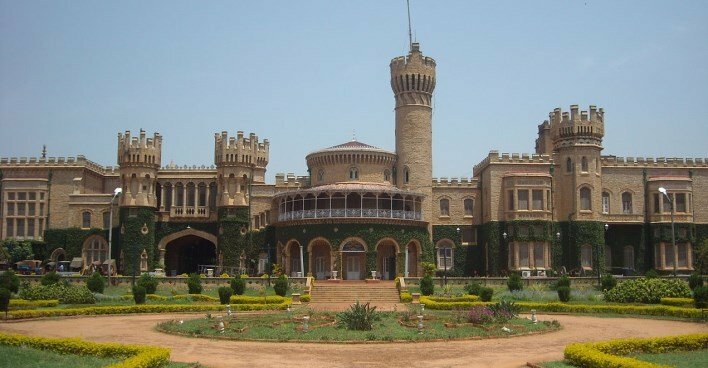 Bangalore Palace is in the Vasanthnagar area of the city and the main roads around the grounds are the Palace Cross Road, Bellary Road and Sankey Road. Mekhri Circle is one of the major intersections near the Bangalore Palace. There are many bus routes that ply around this area. The area is commonly referred to as Palace Grounds and some of the BMTC buses which ply out of the central bus terminal include 287, 287B, 287C, 287D and 287E. Auto-rickshaws and private cabs are also easily available. The Bangalore Palace is intertwined with the history of the city. Its European architecture is a reminder of the colonial legacy of the town while its opulence also showcases the riches of the local kings. The expansive Palace Grounds around it were once a famed venue for international music acts, so this location has an important place in Bangalore’s contemporary culture too. A visit to the Palace is a must, a step back in time and away from the modern landscape that prevails everywhere else.